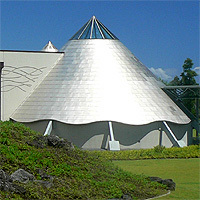 Situated near Sunrise Ridge overlooking Hilo Bay, 'Imiloa is an impressive modern exhibition center and planetarium. 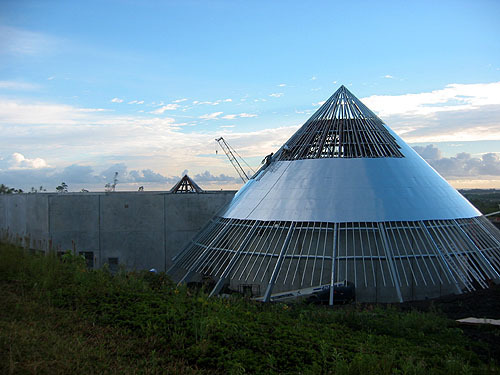 A spectacular 40,000 sq ft. building consists of three titanium coated inverted domes, representing the volcanoes Mauna Loa, Mauna Kea, and Hualālai. 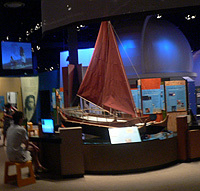 Built at a cost of over $28 million 'Imiloa provides a mixture of Hawaiian culture and modern astronomy with exhibits and shows designed to please everyone from children to adults. 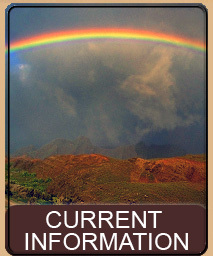 'Imiloa is open every day except Mondays, from 9:00 am through 4:00 pm. 'Imiloa is also open all holidays except for Christmas and Thanksgiving. depicting the discovery of the islands by the polynesian explorers. 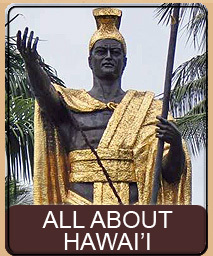 'Imiloa is located in the town of Hilo on the Big Island of Hawai'i. 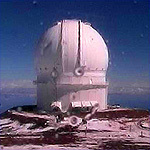 It is situated in the Astronomy Research Park of the University of Hawai'i at Hilo. 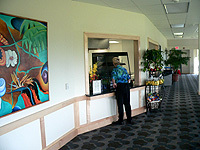 'Imiloa sits near Sunrise Ridge overlooking the town of Hilo, the Hilo bay front, and Pacific Ocean. 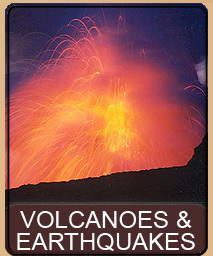 If coming from the Hilo Airport area... Take Kanoelehua Highway (Route 11) towards Volcano (south) to Puainako Street (just past Prince Kuuhio Plaza, Puainako Street has a large KTA grocery store on one corner). Go right on Puainako. Follow Puainako all the way to the end which is the intersection with Komohana Street. Turn right on Komohana and continue for 1/4 mile to Nowelo Street. Nowelo Street is also marked with Astronomy signs. Make a right on Nowelo and you will see 'Imiloa ahead on the left. Go past the first street (which has the Hilo base facilities for many of the observatories on Mauna Kea) and continue to the second intersection where you make a left into the 'Imiloa parking lot. 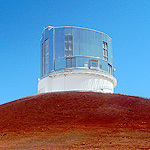 Construction on the Mauna Kea Astronomy Education Center, as 'Imiloa was original called, started in 2002 (with the actual first portion of the building going in on May 10, 2004) and ended in November of 2005. 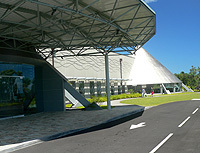 Built by the Taisei Construction Corporation the completed center has over 40,000 square feet of building space and 72,000 square feet of landscaped native Hawaiian plants. 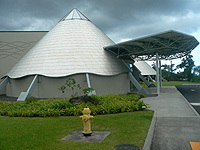 'Imiloa opened to the public in February of 2006. To read more about the construction of 'Imiloa please read our The Construction of 'Imiloa article. 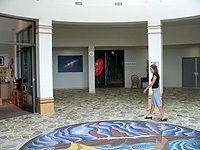 The 40,000 square foot 'Imiloa facility houses a 12,000 square foot exhibition area, a state of the art Planetarium, a Gift Shop, a restaurant, and spacious conference facilities. 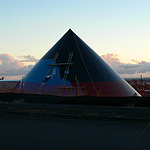 The facility has one main entrance which takes you into the middle glass-topped cone. Immediately upon entering you are greeted by a huge circular tiled floor depicting the discovery of the Big Island by the Polynesian explorers. This theme is very fitting for an astronomy facility because the early explorers were outstanding experts in navigating by the stars. 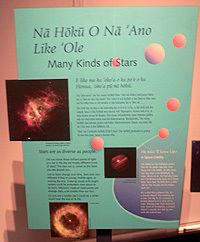 This theme also reinforces the mandate that 'Imiloa attempts to fuse Hawaiian culture with modern astronomy. 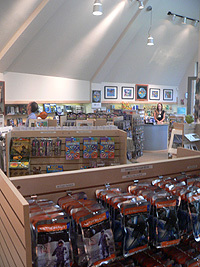 Once you enter the facility immediately to your left is the Gift Shop. 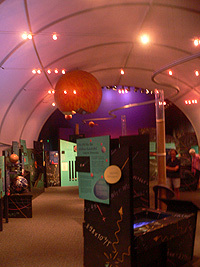 Next to the Gift Shop is the entrance to the Planetarium, and next to that is the entrance to the main Exhibition hall. To your right is the service and information desk and next to that is a long hallway to the right most dome which is the Cafe. 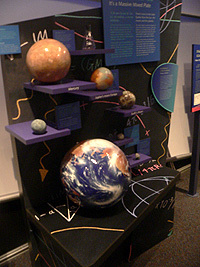 Upon entering, first-timers should proceed directly to the service and information desk at your right to purchase tickets and find out about planetarium shows and times. Tickets are $14.50 for age 13 to adult, $7.50 for children age 4 to 12, and free for children under 4 years old. For people who anticipate going frequently a variety of memberships are available, some of which allow you to bring guests in at no additional cost. For people with local IDs the center also offers a kama'aina rate. 'Imiloa also offers group discounts to groups of 12 or more and to pre K-12 school field trips (reservations need to be booked in advance). Let us start at the very left and work our way around to the right of the main lobby area. To our very left is the Gift Shop. While fairly small the shop offers a rather astonishing assortment of both local Hawaiian crafts and astronomical / scientific delights. Everything from toys, including robots, to posters and books is available. 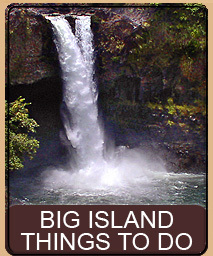 Locals should add the 'Imiloa Gift Shop to their Christmas shopping destinations as it offers an array of educational and fun gifts that you won't find in other local stores. 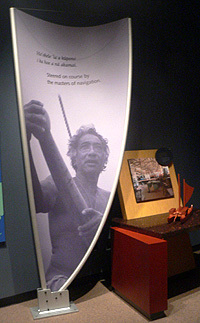 Members of 'Imiloa receive a 10% discount on anything purchased at the store. Many of their products are attractively priced. Because the store tends to purchase in smaller lots the inventory changes frequently. This means that you should always stop in to see what new gadgets or crafts they may happen to have. 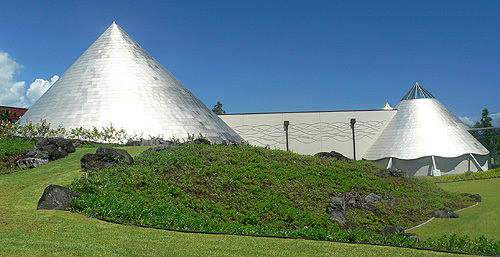 One delightful experience that 'Imiloa brings to Hilo is a state-of-the-art planetarium complete with an advanced laser light system. 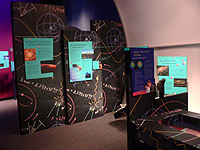 The planetarium features the new Evans & Sutherland Digistar 3 Fulldome Digital Theater System. 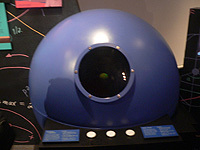 This state-of-the-art planetarium projection system features the very latest digital (computer) visual system and includes 8 watts of laser projection power. Currently the Digital Theater System is being completed and the laser system has yet to be installed. 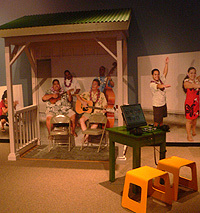 However, the digital projectors are in place and are used to deliver shows such as the Authentic Hawaiian Voyage through Time and Space show and frequent special presentations with Hawaiian Cultural as well as Astronomy and Science themes. Some of the shows are free with admittance to the facility - other shows have an additional charge. Check with the information desk and the 'Imiloa website for upcoming shows and any applicable costs. 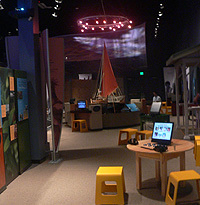 The 12,000 square foot Exhibition Hall can provide hours of exploration and interactivity. 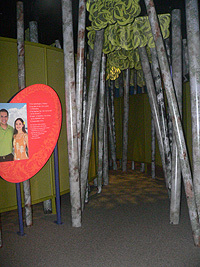 Entrance to the Exhibition Hall begins in an artificial bamboo garden which quickly takes you to a very dark room with a representation of Mauna Kea and the stars overhead. 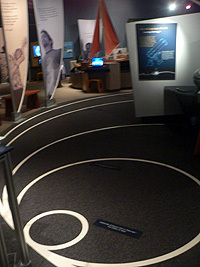 A partial-glass floor reveals chips from adz tools created by early Hawaiian settlers, and taken from an adz quarry on Mauna Kea. 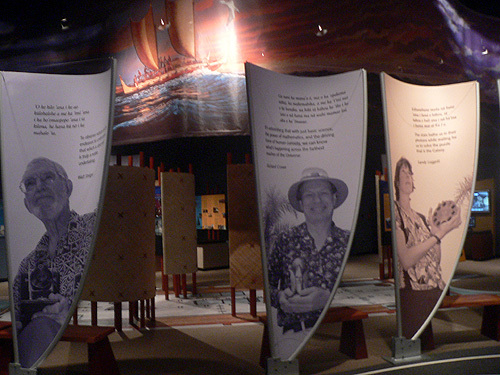 The next two halls feature video presentations, with the second hall offering spacious seating while you watch a multi-media presentation on ancient Hawaiian myth and cultural identity. Upon leaving the media room you transition down a long hallway which contains a montage of photos that spans the earliest of photograph history on the left, to the most recent on the right. 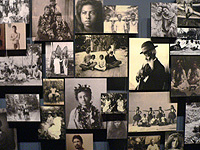 Locals will recognize many a face in this photo history - and even off-island visitors will recognize some of the internationally famous faces on the wall such as Duke Kahanamoku, Don Ho, Jason Scot Lee, and many more. When you leave the hall of photos you enter one end of the main exhibition floor. 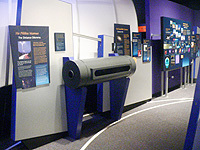 From here to the end you have literally hundreds of exhibits and interactive learning centers to play with. 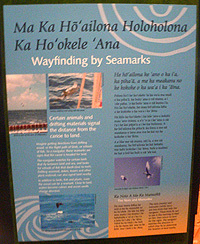 One thing you will quickly notice is that EVERY SIGN - every word in the facility, appears not only in English but also in Hawaiian. 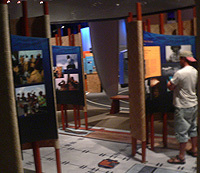 The merging of the languages is done in such a way to be different in each exhibit and to not preference one over the other. 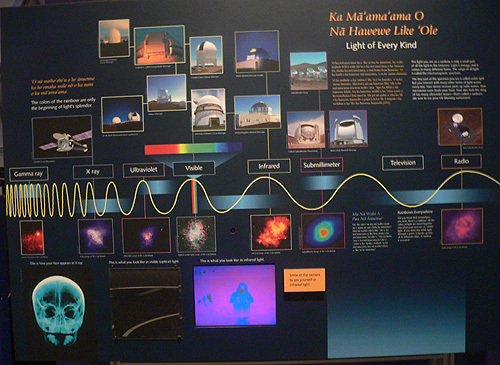 The exhibits are a tasteful blend of Hawaiian culture and advanced scientific and astronomical discovery, offering much to learn about both as well as learning how the two work together. 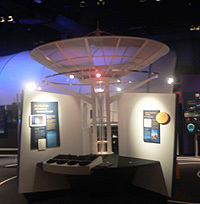 Since 'Imiloa sits just below the Observatory Row, many of the observatories are represented in the exhibits. 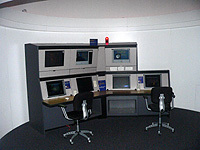 There are comparisons of the different mirror sizes, as well as simulated control rooms and exhibits which show the differences in the various wavelengths the individual observatories explore. 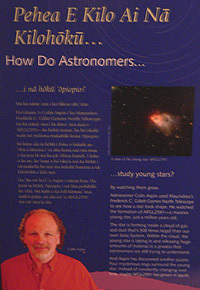 Indeed, as you wander around the exhibits, some of the people wandering near you will be scientists from the observatories on their lunch breaks - so you can be sure the information being presented is accurate and up-to-the-minute. 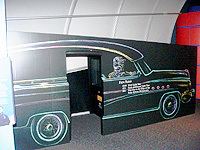 Not to be missed, near the exit of the exhibition hall, is the Subaru 4D2U (Four Dimensions to You) Theater. This small room offers seating that face three 6 foot by 6 foot screens (the best seats are in the middle). Viewers are handed polarized glasses which convert the imagery into vivid 3D. 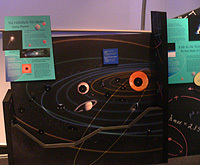 The short film encompasses the creation of the universe along and also how astronomers are mapping the known universe. The 3D is stunning with pieces of stars flying off the screen and nearly hitting you in the face (I find the red stars to be particularly delicious :). A fun diversion with great 3D the film alternates viewings every few minutes from English to Japanese. 'Imiloa also offers full conference facilities which are available for private bookings. The facility includes full internet access, large meeting rooms, and complete catering services. Please contact 'Imiloa for more information. Not to be missed is a stroll around the 9 acre landscaped gardens. 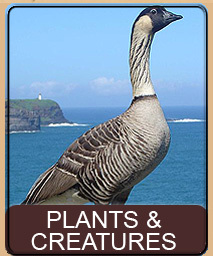 Featuring only native Hawaiian plants the grounds offer one of the largest gatherings of native plants in one public area. The road just behind 'Imiloa houses many of the observatory base facilities. These building is where much of the daytime work and analysis of evening observations takes place. Some of the buildings have their own small visitor centers (such as Subaru Observatory) so a stroll down that street can offer you more interesting sites. 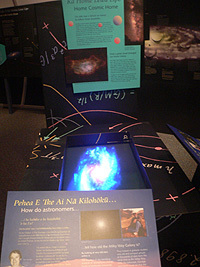 'Imloa is a welcome addition to the Hilo scene and offers a fusion of Hawaiian culture and cutting edge Astronomy in a fun education center. As with any similar center the exhibits can be expected to change and mature and we also await with eager expectations the completion of the planetarium with cutting edge digital laser projection system. 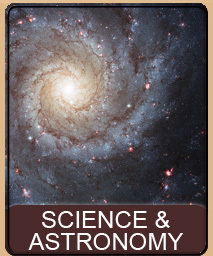 Finally, we have the Cafe, which is just about the only place where you can grab a bite to eat along side of world class scientists and astronomers. With a stunning view and a delicious menu the Cafe caps off a perfect day exploring the cosmos. The large entrance features the beautifully tiled floor. 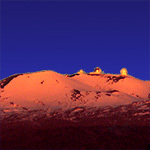 This page is named 'Astronomy.imiloa'. Can't Find It?